This 6" combination polisher/trim saw/grinder has three stainless steel valves that provide independent water flow to both grinding wheels and the expandable drum. A submersible water pump provides cooling water recirculation. The one-piece cast aluminum tank and base has sealed bearings mounted to a 5/8" stainless steel shaft. The end-polishing disc is ideal for final polish and buff . 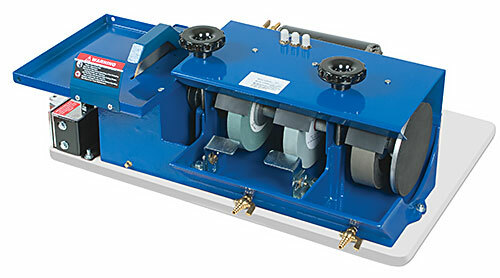 Trim saw has a removable table top and tank drain plug for ease of oil/sludge removal. Without motor, baseboard, GFCI, switch and polishing supplies.